Catgill has been our family farm for the last 60 years and has more recently become home to Catgill Campsite. Catgill Farm has everything you could want from a luxurious Yorkshire Dales holiday. Staying here is an incredible glamping experience that is hard to beat. 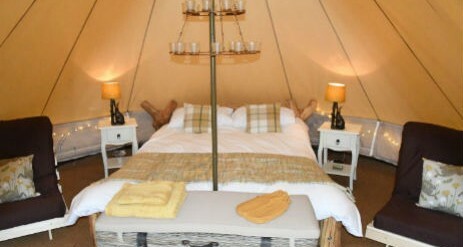 We provide the very best Yorkshire Dales Glamping. 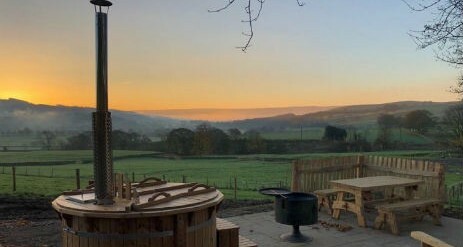 The farm is set in an idyllic location with spectacular views across the Wharfe valley offering a unique overnight experience on the Duke of Devonshire’s Chatsworth Estate in the heart of Bolton Abbey. A central location with plenty to do for all ages and in any weather – it’s the perfect family friendly campsite! The farm is close to Bolton Abbey and is the ideal base from which to explore the Yorkshire Dales National Park. A fantastic place either for an action packed holiday or a tranquil relaxing break. Whichever you choose you will be sure to make some fantastic memories here at Catgill Farm. 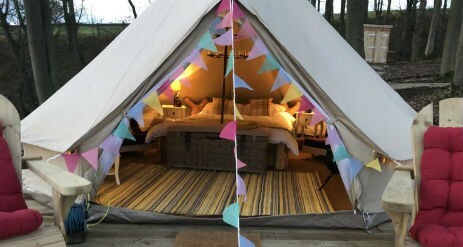 The very best way to experience the stunning beauty of the North Yorkshire countryside and to have a truly luxurious break is to come Glamping at Catgill. We have both bell tents and timber pods all with private log fuelled hot tubs and traditional pizza ovens! Whatever you want from a break you will find it here at Catgill Farm. 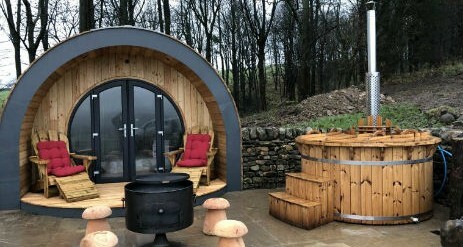 The bespoke luxury Timber Glamping Pods and Bell Tents are set in a stunning location on the woodland edge with uninterrupted views of the beautiful Yorkshire Dales countryside. Our unique timber pods are fully equipped with everything you need for the perfect getaway. Just bring yourselves and start making memories. They are the ultimate in luxury and have been creatively designed to ensure your Yorkshire Glamping experience is truly unforgettable. From the moment you arrive you will be surrounded by luxury in one of our uniquely styled pods. 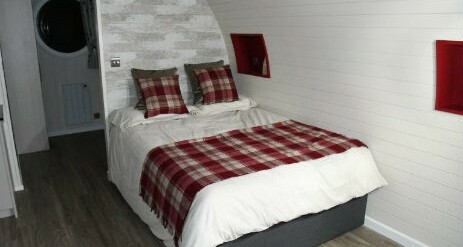 Each pod is the same size and specification and can sleep up to 6 people. They each have their own unique woodland scheme, choose form the Stag, the Duck or the Pheasant. Everything you need is provided including bedding, towels and kitchen equipment. All 3 pods are fitted with a small fully equipped kitchen comprising a hob, microwave, kettle, toaster and fridge. They have a double bed, 2 single bunk beds and a comfy sofa bed. The integrated shower room is equipped with a walk in shower, hand basin and toilet. The pods provide perfect year round accommodation. They are fully insulated and have central heating for those chilly winter nights where you can snuggle up amongst the cosy cushions and throws with a cup of hot chocolate. Each pod has a 32″ smart Tv and is connected to the Internet so bring along your Netflix account details and relax watching your favourite film. furnished and accessorised. Everything is provided for a super cosy stay, each has a handcrafted, king size, driftwood bed with duvet, pillows, cushions and throws. A small sink with fresh drinking water is provided and each tent can sleep up to a family of 4 with futons for the kids. The bell tents are fully equipped with bedding, towels, bedside tables with lamps, a chest of drawers, blanket box, crockery, cutlery, glasses, cups and cooking utensils. All you need to bring is your imagination and a sense of adventure. The 2 bell tents have a shared shower toilet pod with a sink for pot washing outside. We understand that some people like to escape from technology, but for those that can’t live without it while you’re glamping, your timber pod or bell tent has wifi installed. Both the timber pods and bell tents are well equipped for luxury outdoor living. Each has a log-fuelled hot tub, 2 comfy chairs, a large picnic table and a fire pit with built in pizza oven. Relax on your own private patio whilst gazing at the amazing views on the two laid back comfy chairs or take a dip in your hot tub while the sun sets and you are surrounded only by the beauty of the starlit skies. With no light pollution, you can gaze at the dark skies, picking out your favourite star constellations and planets. The hot tub takes around 2-3 hours to heat so we offer a pre-lighting service for £15, which guarantees that your hot tub is just at the right temperature for your arrival. A bag of logs is provided and extra bags are available at a cost of £7 each. The large fire pit has a grill for cooking and a built in pizza oven, then after a hearty meal you can have fun toasting marshmallows or making popcorn in the popcorn pan provided. The farm is situated on a small country lane away from the hustle and bustle and only the sound of birdsong and the occasional hoot of a nearby owl. It is a natural playground for kids, they will love exploring the surrounding woodland, playing games and making friends in the fields around the farm and campsite, keeping them occupied for hours. Don’t miss our morning coffee shop, selling barista made coffee and freshly baked croissants and pain au chocolate. No matter how hard we try we always forget something! But don’t worry our small onsite shop situated in our new reception area is perfect for any basic essentials that you may have forgotten. One of the many benefits of staying here at Catgill is that we are close to so many local attractions so there is no need to use your car during your stay. 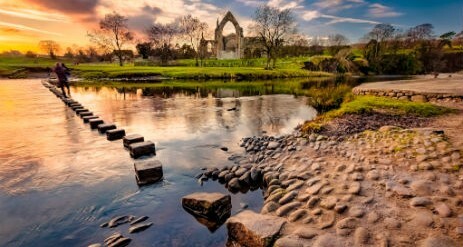 Hesketh Farm Park is a 2 minute walk from our doorstep and the famous Bolton Abbey is a 10 minute walk away. Both amazing days out with plenty to keep both kids and grownups occupied. The village of Bolton abbey itself is a10 minute walk from the farm and is home to the famous priory which dates back to the 12th Century, here you will also find the river Wharfe and stepping stones. Also within a short distance from the farm there is Billy bobs diner and Yorkshire Dales ice cream factory, the Embsay-Bolton Abbey steam railway, Skipton Castle and the famous ilkley moor with the unique Cow and calf rocks. In addition to the many surrounding picturesque towns and villages such as Burnsall and Grassington, the area boasts many good restaurants and coffee shops, a variety of shopping opportunities and many local seasonal events. Catgill farm is the perfect place for a memorable stay in the Yorkshire dales. Catgill is also close to many popular cycling routes including the famous Tour de France and Tour de Yorkshire routes and offers an excellent base to explore the Yorkshire Dales. If mountain biking is more your thing, we are within 1 mile of the nearest bridleway which leads to miles of off-road biking and the challenging hills of the dales.